Can you believe it took me this long to own an off the shoulder maxi dress? Ok, maybe it is not a surprise to you, but to me it is LOL. Probably because I love love love wearing anything off the shoulder. So I thought it was only a matter of time that I would own an off the shoulder maxi dress. I guess I was wrong, oh well. Remember in this post when I talked about rediscovering Forever 21? Well, my other purchase was this maxi dress. 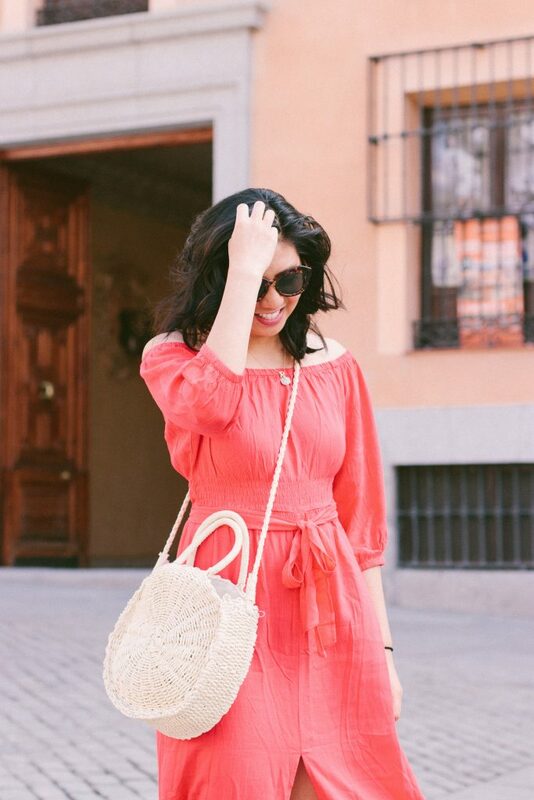 While I was planning out my outfits for my trip to Madrid, it looked so perfect for Spain. And right when we were walking around the streets of Madrid, on our last day, I was in awe how this red dress just complimented against the buildings of Madrid. Of course, this dress had been in stock up until now, but there are very similar options available at Forever 21. The pink one is the closest to the one I’m wearing. In terms of sizing, the dress fits true to size. I’m wearing a size small. And I’m actually impressed with the length. I’m 5’4″ and sometimes I struggle with maxi dresses being too long. This one was just right. I also loved that it stayed off the shoulder. I rarely had to pull it down. Maybe occasionally when I decided to have my arms up. But when I’m reaching my hands or arms out or moving around, no issues there. I think it is probably because the elastic had some give. It wasn’t too tight, but not too loose that it falls off. It just sat comfortably right past my shoulder. 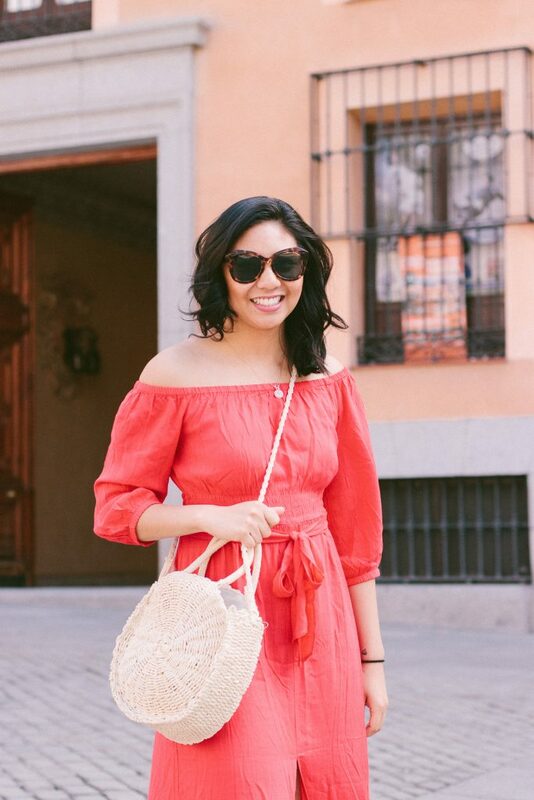 If you’re still unsure if it will stay off the shoulder, this red maxi dress is another great alternative that looks very similar to mine. The arms are its own sleeves, but it has the illusion of being off the shoulder! If you’re wondering where in Madrid this was taken, it on the way to the Royal Palace on some off beaten street. We just wanted to wonder around. In my opinion, walking on foot is the best way to see a new place. Btw, I know I said I would have the rest of the travel guides to Barcelona, Lisbon, and Porto up by now. So sorry. These travel guides take a lot of time. I want to make sure they are thorough so that people can actually find them helpful and there are a lot of pictures to edit! But my goal is to have the Barcelona travel guide up within the next week or two! Love a good maxi dress, the colour is gorgeous! 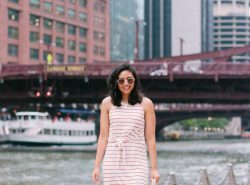 I don’t own an off the shoulder maxi but your post is making me reconsider! I love love love this look on you! This dress looks gorgeous on you and so does the colour! 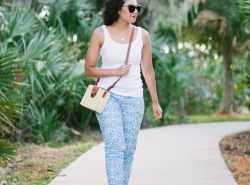 This maxi looks super lightweight and airy, perfect for travel! I have one off shoulder maxi but I have not worn it yet. Time to bring it out. Love the color of your’s. Thank you Tanvi! Definitely time to bring it out! Gorgeous as always Rach!! Love the color!! They are definitely worth trying! Thank you Kara! Can you believe my bag is only $25! that maxi dress is so beautiful! i am LOVING the gorgeous color on you! Ooooh I love the color and style on you! I love it! The color, the off-the-shoulder part, the maxi part, everything! You look amazing! This dress is so pretty! I love how you styled it! This is such a cute dress and I love the color! And loving the off shoulder and tie waist detail, so chic. Looking so chic in this maxi dress babe. So lovely maxi dress dear! You look amazing! I loooove H&M- and this color is so damn pretty! H&M is such a great place to shop! Thanks Ashley! This dress looks so pretty on you! Such a gorgeous color too! Gorgeous dress! I really like it! You look so beautiful! This one definitely would be perfect for Fall! Thanks Laura! Red simply looks so amazing on you! What a pretty and versatile OTS dress! I’m loving this gorgeous color on you. That dress is so pretty and perfect for summer! Love that color on you! Such a beautiful dress on you! You look amazing! I love maxi dresses and off the shoulder tops. So the fact that they actually have off the shoulder maxi dress makes me happy. Too bad summer is almost over. But next year I am getting a few. Girl, in my mind it is still summer! This is such a gorgeous maxi on you dear! So breezy and such a chic colo!